We’re very lucky here at Spin A Yarn to count one of the current top lace designers of the knitting world, Anniken Allis, as a great friend and well established workshop teacher. 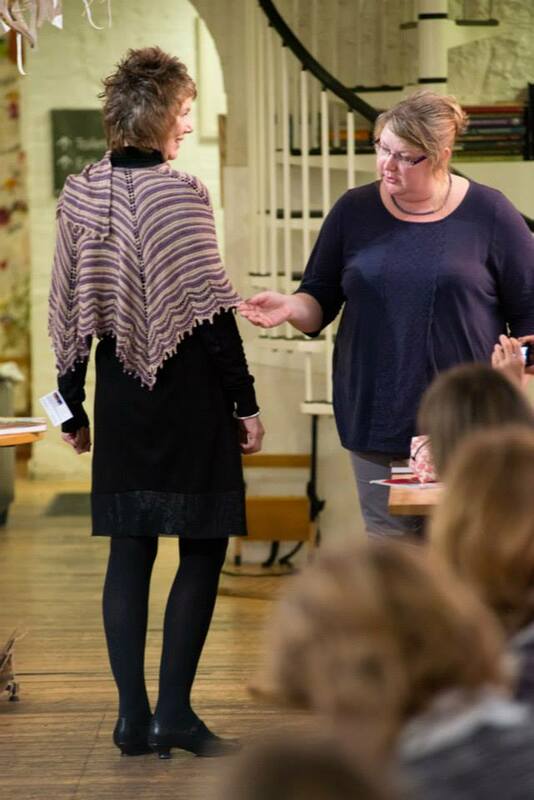 Hailing from Norway, knitting is in Anniken’s blood – having learnt Continental knitting from a young age, she started designing patterns in her early 30s and her love affair with designing beautiful lace accessories and garments began. 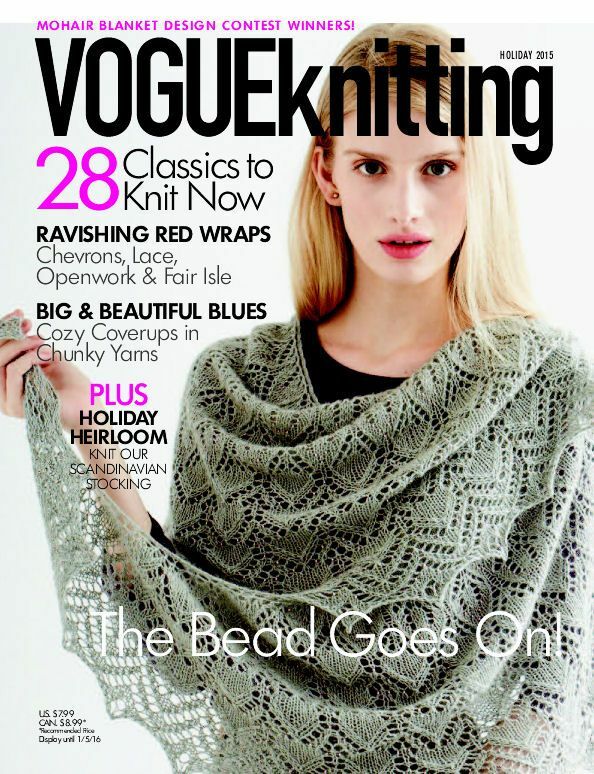 Now a published author (of Beaded Lace Knitting) and having had her work featured on the front of the highly respected US Vogue Knitting, we are thrilled that she regularly travels up from her home in beautiful Cornwall to continue teaching workshops with us – on everything from how to knit Continental style, to Norwegian ‘Selbu’ style mittens. 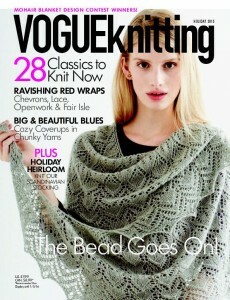 Anniken’s delicate and glamorous shawls feature novel stitch techniques, unusual cast-offs (and sometimes cast-ons! ), and often beading… she teaches all of these techniques and more on her dedicated workshops for each pattern. In the morning you learn the techniques required, and in the afternoon you start your own project, choosing from the wide selection of beautiful yarns we stock here at Spin A Yarn (workshop attendees get an extra discount voucher on the day!). We have a few spaces left on each of these workshops, so if you’d like to embark on making a gorgeous accessory with Anniken’s help and advice, do give us a call on 01626 836203 to secure your place. These workshops cost £49 each, run from 10am to 4pm, and include a copy of the pattern plus Joyce’s home-cooked lunch and tea-time treats. 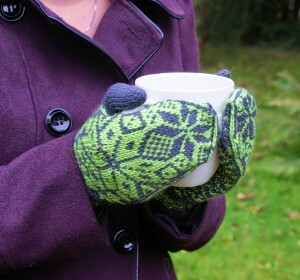 They are suitable for confident novice or intermediate knitters, or confident knitters who just want to enjoy knitting a new pattern in good company! 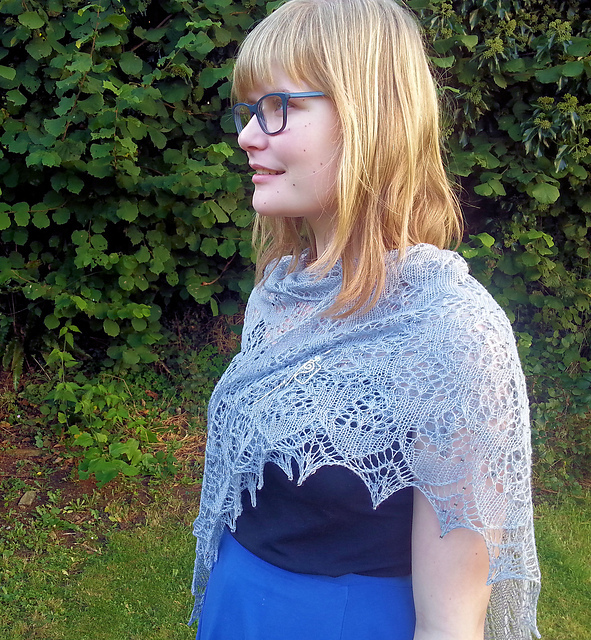 An elegant crescent shaped shawl worked from the top-down with an eyelet garter stitch pattern. Two short row wedges and a beaded picot cast-off add interest to a fun accessory. 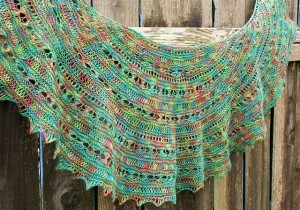 In the morning you’ll practice the techniques used to knit this shawl including short rows, adding beads using a crochet hook, picot cast-off, and how to shape the shawl. In the afternoon you will start your own St Aubin’s Bay shawl with the 4-ply/sock yarn and beads of your choice. The Daisy and Mar Menor shawls are both fun shawlettes featuring unusual stitch patterns and are some of the most popular in the shop! In this class you’ll learn the elongated and crossed stitch patterns used in these two shawls, as well as how to add beads using a crochet hook, how to work a beaded picot cast-off, and how to shape both shawls. 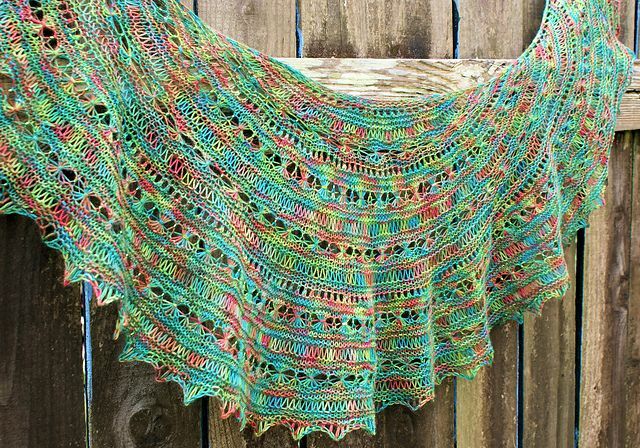 In the afternoon you’ll be able to start your own Daisy or Mar Menor shawl with the 4-ply/sock yarn and beads of your choice. 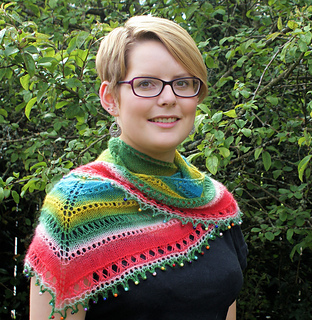 An eye-catching crescent shawl worked from the top down, with multiple yarn overs used in the edging to create a big impact. In the morning you’ll practice the techniques used to knit this shawl, including how to read a lace chart, how to work large yarn overs, and how to shape the shawl. 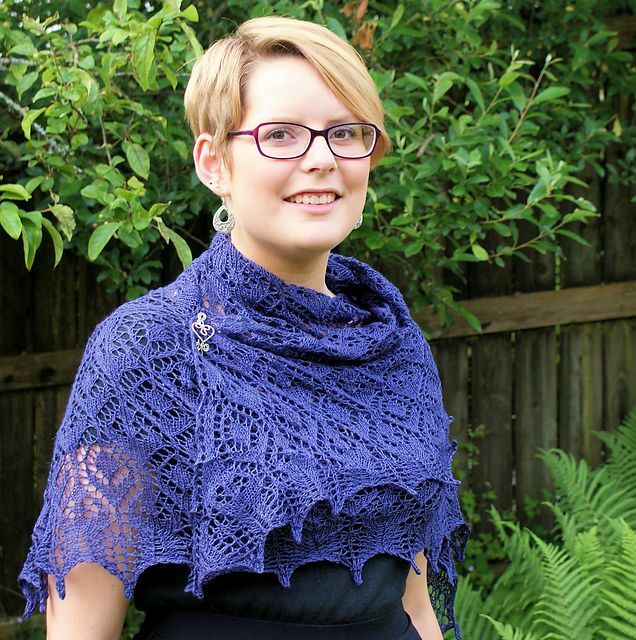 In the afternoon you’ll start your own Persephone shawl, with the 4-ply/sock yarn of your choice – enjoy choosing two contrasting or gently complementary colours. 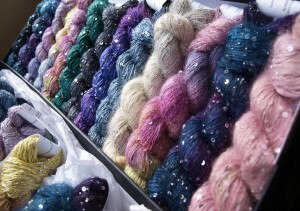 Our long-awaited delivery of ArtYarns skeins from the US has now arrived! Opening the box is always like opening a treasure chest full of silky and soft yarn, hand painted in jewel tones, sparkling with sequins and murano glass beads. 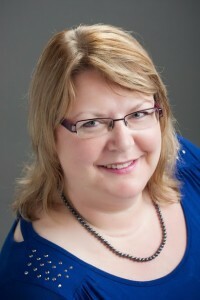 The company is the brainchild of designer and author Iris Schreier, who started the company in 2002. 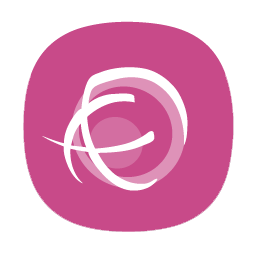 We were lucky enough to be able to ask Iris some questions recently – and her answers are fascinating. 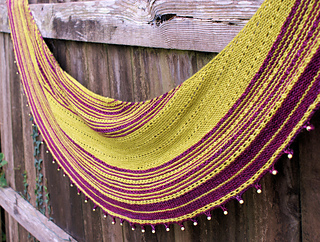 Spin A Yarn: Where did the inspiration to start ArtYarns come from? Iris: I was working on my first book Exquisite Little Knits, and I couldn’t find certain yarns that I wanted to knit with, so I created them myself. 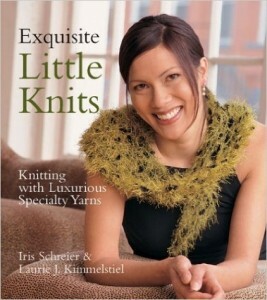 Examples: a lightweight silk that would be perfect for scarf designs without being too heavy knitted up—this became Regal Silk; a hand-dyed cashmere that was carefully dyed in sophisticated colors—this became Artyarns Cashmere 5; A beaded yarn that would not have any synthetic in it—this became Beaded Silk Light. Stores because interested in these yarns I developed, and Artyarns was born. Spin A Yarn: What is your favourite source of inspiration for the beautiful hand-painted colourways? Iris: I mostly approach color ways as a designer—I think I am inspired to design certain pieces and develop colors that will work with my designs. Our latest collection of Cosmic Colors inspired by the randomness of the constellations, helped me develop one of my favorite new pieces the Swirl Tee, which needed a fun, bright, multicolored yarn that would not pool and interfere with the pattern. Spin A Yarn: Our favourite ArtYarn blends are Beaded Silk Sequins Light and Beaded Mohair & Sequins, do you have any favourite patterns which you think showcase these yarns particularly well? 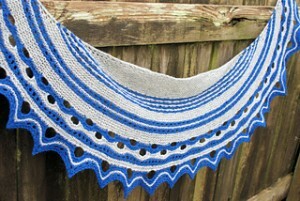 Iris: Both these yarns are embellished and knit up like lovely jewelry. We have put huge collections of patterns free on the yarn label, mostly 1-skein projects. 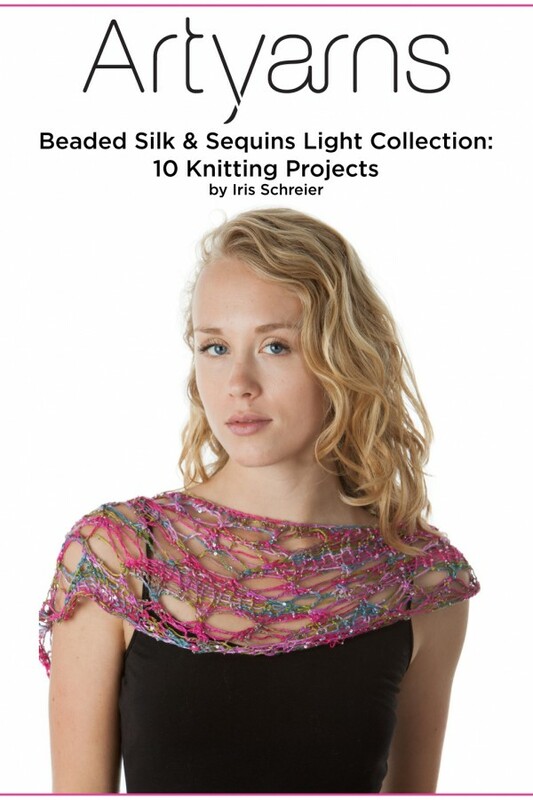 Look at the Beaded Silk & Sequins Light Collection of 10 patterns, free on the Beaded Silk & Sequins Light yarn label—I love the Silk Bouquet Scarf. Also refer to the Beaded Mohair & Sequins Collection, free on the Beaded Mohair & Sequins yarn label—this contains 6 lovely patterns, including the Raspberry Stitch Mini Shawl designed by a very talented designer in South Korea. Spin A Yarn: How long does it take to produce a batch of hand-painted yarn? 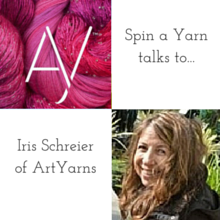 Iris: We have a group of dyers working all day every work day, and we can produce several hundred skeins per week. Some colors are more complicated than others and take longer. 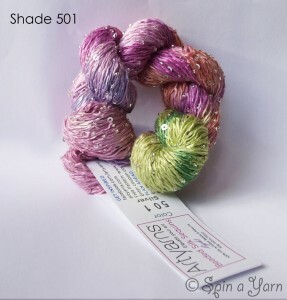 We have a video of how we actually do the dyeing of certain multis – please click here to watch the delicate process by which the skeins are hand-painted: Shade 501 Hand-Dyeing Process. And here’s what the finished yarn looks like! Spin A Yarn: We’re always impressed by your dedication to sharing your work and helpful hints on social media – what do you most enjoy about relating to other ‘yarn addicts’ online? Thank you for taking the time to talk to us, Iris! You can find her yarns on our website here: ArtYarns available at Spin A Yarn, or pop into the shop and ask Joyce to show you the ‘treasure chest’ of skeins! We can help you find suitable patterns and provide you with the beautiful free patterns which come with the yarn when you buy it.